This luxury villa is absolutely beautiful and has plenty of room for any group. The outdoor space is amazing, with water sports equipment, an outdoor kitchen, and beach access. There’s artwork and unique lighting throughout the home, and every bedroom is well-sized. You’ll love the space and beauty of Kaia Kamina! Spectacular beachfront villa with accommodations for a large family or group! Kaia Kamina is a Cayman Kai villa that feels like a boutique resort. Minutes from Rum Point, this child-friendly vacation rental has more than enough activities for every traveler. Beautiful, sea-inspired mosaic tile frames the sides of the infinity edge pool, which flows into a fountain below. A sun deck borders three sides, with plenty of loungers for guests to sunbathe and snooze in. There’s an outdoor kitchen in the oversized gazebo that’s fully equipped with a propane grill, sink, fridge, ice maker, and dining area. 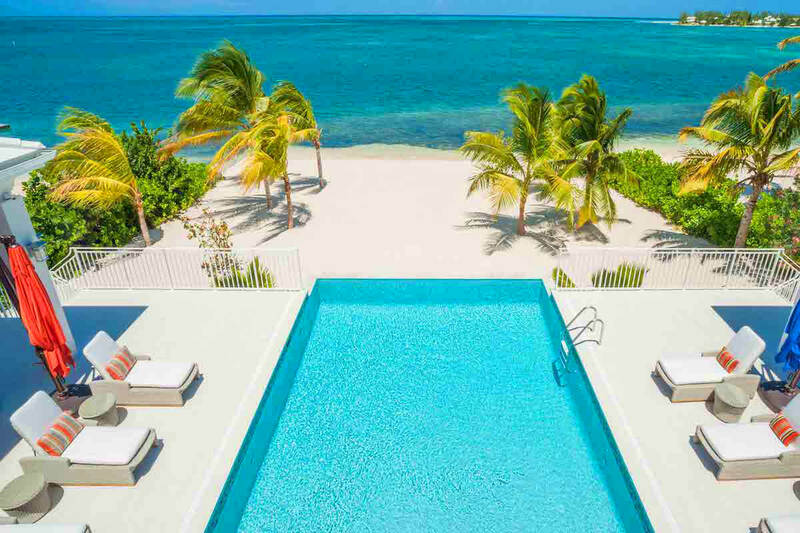 Guests can play a round of lawn games on the pétanque court or ride around Cayman Kai on the villa’s bicycles. On the beach, guests can kayak, snorkel, paddle board, and stroll to their heart’s content. The water is shallow and the sand is like powder. Speakers and landscape lighting run throughout the exterior, and there are various pool/beach toys. Guests can access the fully air-conditioned interior through glass French doors. The dining room and kitchen are on one side and the lounge is on the other. The kitchen is fully equipped with stainless steel appliances, a Keurig, a Nespresso, and a breakfast bar. Near the foyer, there’s a media/game room with an Apple TV, Xbox One, mini fridge, and a queen sofa bed. There’s also a huge laundry room opposite. All five of the Main House bedrooms are on the second floor. The three king suites each have ocean views, access to a shared balcony, an Apple TV, and an ensuite bathroom with a soaking tub and a walk-in shower. The fourth bedroom has a garden view, two twin beds that can be converted into a king, an Apple TV, and an ensuite bathroom. The fifth floor is a children’s room with two sets of bunk beds, an Apple TV, and an ensuite bathroom. The Carriage House holds two more bedrooms, each with a king bed, ensuite bathroom, kitchenette, and small balcony. Cayman Kai is a residential resort community near Rum Point Club. Guests can walk to a coffeeshop, ride their bikes through the neighborhood, or take a short drive to nearby restaurants. Direct access to private beach, as well as a 3 minute walk to Starfish Point Beach.